This piece is dedicated to any Police Officer who has been stung by "The Deal." "These be the names of the mighty men of whom David had: The Tachmonite that sat in the seat, chief among the captains; the same was Adino the Eznite: he lift up his spear against eight hundred, whom he slew at one time. And after him was Eleazar the son of Dodo the Ahohite, one of the three mighty men with David, when they defied the Philistines that were gathered together to battle, and the men of Israel were gone away: He arose, and smote the Philistines until his hand was weary, and his hand clave unto the sword: and the Lord wrought a great victory that day; and the people returned after him only to spoil. And after him was Shammah the son of Agee the Hararite. And the Philistines were gathered together into a troop, where there was a piece of ground full of lentiles: and the people fled from the Philistines. But he stood in the midst of the ground, and defended it, and slew the Philistines: and the Lord wrought a great victory. And three of the thirty chief went down, and came to David in the harvest time unto the cave of Adullam: and the troop of the Philistines pitched in the valley of Rephaim. And David was then in an hold, and the garrison of the Philistines was then in Bethlehem. And David longed, and said, Oh that one would give me drink of the water of the well of Bethlehem, that is by the gate! And the three mighty men brake through the host of the Philistines, and drew water out of the well of Bethlehem, that was by the gate, and took it, and brought it to David: nevertheless he would not drink thereof, but poured it out unto the Lord. And he said, Be it far from me, O Lord, that I should do this: is not this the blood of the men that went in jeopardy of their lives? therefore he would not drink it. The text continues on from there. But if I can point out a few things about this portion of scripture; a few things about these men and how it all relates to our current spiritual warfare. First, none of these guys gave up. Period. They stood their ground, they believed in what they were doing, they understood that the Lord was working in this situation; in this case, the impending ascension of David to the throne of Israel. In your case, the high calling of a Police officer. The first one, Adino. He took on eight hundred opponents and over came them. This was in hand to hand combat. Impossible? Yes. But with God and in the strength of His Holy Spirit, nothing is impossible. One by one he overcame each opponent. How long do you think that took? All day? It doesn't say. But it took some doing. Yet he refused to surrender, and God helped him in the battle. At what time in this monumental personal battle did he come to the point, that point we have all been to many times, where he was just going to quit, where he was just going to give up? At the thirtieth opponent? At the six-hundredth opponent? At what point did he come when he had finally surrendered all to the Providence of God and the Lord was free to fight this battle through him? Yet, this is exactly what happened as it clearly stated the "Lord wrought a great victory." The second one, Eleazar. It says the men of Israel had run away. Not him. He was all alone. Just him and God. In the enemy came, it doesn't say how many there were, but he hit them head on. It says his hand grew weary. I'm sure it did. The physical exertion for this type of medieval hand-to-hand combat had to be monumental. Yet he refused to yield, to give up, to surrender. And God Himself backed him up, and his hand "held fast" to the sword. And he overcame, and it says the LORD wrought a great victory that day. The third one, Shammah. He stood in the middle of a bean field, and again, all alone as the people had fled away, he took on the enemy. It says he "defended it." His bean field, his own little plot of ground. That which represented his life and sphere of influence. Win or lose, live or die, never surrendering. And one by one, trial by trial, he took them down. No one was going to take his bean field. And God honored that, and it says again, the LORD wrought a great victory. As for these three breaking through the Philistine line of defense to access the well inside the enemy perimeter at Bethlehem, that showed a certain "attitude," a certain mindset on the part of these three that made them some of the greatest in David's top chain of command. Basically, there was no challenge they were not going to face. These were warriors, possessing the warrior mindset and worldview. Living out in the desert with David, living a life that was surely most basic in form, they realized the grand scheme of things that they were directly involved in, which, even though from outward appearances according to the world, they had the inferior position, yet in God's Eyes, they were superior in all things. 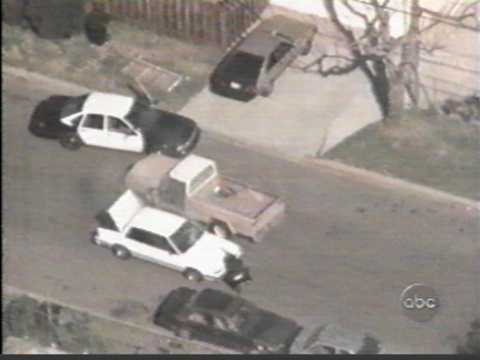 I remember watching the overhead video from the news air unit of the much televised "North Hollywood Bank Robbery" that took place in Los Angeles. These guys were armed to the teeth, with full body armor and fully automatic, heavy caliber weapons. The first suspect was taken down on the sidewalk a short distance from the bank after firing indiscriminately throughout the neighborhood and exchanging multiple rounds with the LAPD. The second one hijacked a car which was disabled a short distance down a side street. The suspect got out and was trying to load up his weapons into a commandeered truck, but suddenly stopped, crouched, and started firing back in the direction he had come. A Police unit with four cops had just barreled down the road at him, straight into the hail of lead, and as they got out, started firing back. The incident swiftly ended right there. Sometimes in the war against "evil," the war on crime; not only as a cop, but as a Christian, it comes down to a no holds barred, just slug it out situation, and only your faith in God will bring you out the winner. Life does get messy sometimes; it doesn't always go down "by the numbers." We tend to have preconceived notions of how life "should" be, how life should be as a Christian cop. Yet Christians, and Christians as cops are in a very high-profile warfare condition. Christians as soldiers of Jesus Christ, fighting the forces of darkness every day, and Christian cops being in even a more hazardous position, fighting the crime, and against the visible manifestation, of that demonic influence in the temporal realm. Now, the rest of the text gives a few more accounts of insurmountable odds being overcome, but I'm sure you get the idea. Were these guys portrayed in the Bible account just plain crazy? I don't think so. Were the officers in that pursuing unit crazy? Of course not. They believed in what they were doing, what they represented, what was being fought for. To protect and to serve. The Lord honored all of them for that. A critical point to remember is that they hazarded their lives to accomplish the objective, to protect society, or "loved not their lives to the end." As Police officers you are truly required to sacrifice many things for the honor and prestige to wear the badge. It is a very high calling. When the pressures and challenges of the job start to really press in, when the Philistines are surrounding you and your positiondon't drop the Sword. When you hear about an officer being ambushed and killed by a previously released felon and the rage and fury threatens to overtake you, stand against it with the power of the Holy Spirit and patience, prayer, restraint, and faith. When a violent criminal you have arrested gets off on a technicality and you see him back on the street, make the choice to refuse to surrender to despair and frustration. With cunning, realize there will be a next time, and deny the enemy, Satan, the victory of a bitter spirit on your part. Resist him. When the pressures of this high-profile warfare position in Him starts to affect your marriage and personal life, commit yourself wholly to Him and modeling the fruits of the Holy Spirit, which is love, patience, and grace. Maintain those contacts you have with other Christian law enforcers in the field, and always seek their support, counsel, and prayer. Make the choice to refuse to give in to despair and bitterness and frustration, whether it be with the criminal justice system or the condition of society as a whole. For an unbelieving Police officer, all he has is his own sense of honor and commitment, his own moral strength and ideals. But you have access to the Throne of Heaven, the Secret Place of the Most High; you're a little different. As a spiritual warrior, you understand that the primary enemy you are dealing with are the forces of darkness themselves, as they seek to bring your nation to ruin, working through a society that is dealing with the repercussions of their own rebellion against God's Law. A Christian police officer, polished and disciplined, a Christian warrior, is truly a formidable weapon in His hands. The Bible says that "We can do all things through Him who strengthens us." (Philippians 4:13) You can overcome in the field of law enforcement. You can overcome as a Christian Police officer, whether in your professional life or private. But why not? The Lord recruited you into professional law enforcement in the first place, and He doesn't make "errors" or mistakes in that regard. He didn't call you into this very difficult field just to abandon you to the dogs on the street. So choose to overcome! God bless all of you as you stand and defend your bean field! Click here to return to Salem's COPS page! "The Bean Field" Copyright 1998 Michael A. Baker All Rights Reserved. Law Enforcement personnel feel free to distribute.